Some more advanced Mac troubleshooting and diagnostics techniques require a user to access the Terminal from Mac OS Recovery Mode. We’ll show you how to quickly access the command line while a Mac is booted into Recovery Mode. For some quick background, on a normally booted Mac, the Terminal application is found within the /Applications/Utilities/ folder, and it can be accessed directly through the folder hierarchy or by using Spotlight to search for and launch Terminal app. But Recovery Mode does not have the same applications directory access, nor does it have Spotlight or Launchpad. Nonetheless, accessing Terminal from Recovery boot mode is easy. Terminal app will launch within Recovery Mode, ready for your commands, whether it’s resetting a password, clearing out disk space, disabling or re-enabling SIP in Mac OS, or any of the other myriad functions available via the command line. The terminal is powerful and requires exact syntax to execute commands properly, it’s also unforgiving in that an improperly typed command can have very unintended side effects that are irreversible. That, plus the generally more archaic user interface of text input, make the command line most appropriate for advanced Mac users only. We regularly cover all sorts of Terminal and command line tips, so feel free to browse around and learn a bit more if interested. 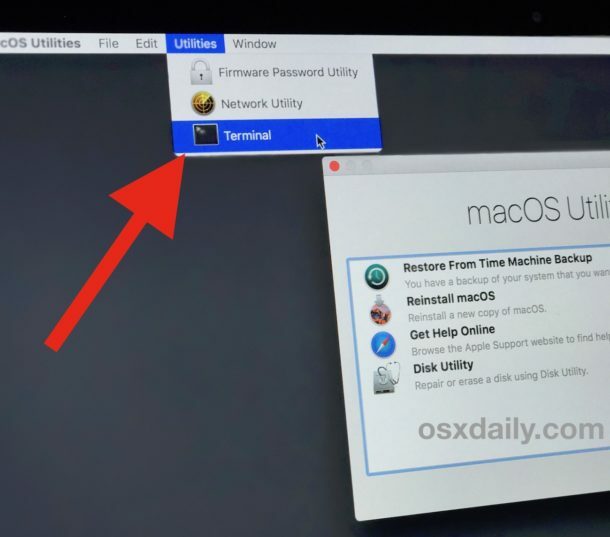 Rarely, some Mac users may find that the “Utilities” menu is totally missing from Mac OS recovery mode entirely, which negates the ability to access the Terminal. This is usually due to an issue with the recovery mode partition itself, which may need to be recreated, or due to booting from internet recovery mode rather than normal recover mode. Hello. I’m not seeing Terminal as an option anymore since I downloaded Mojave. Is there something I’m missing, or has Apple removed it? Thanks.